Tornadoes are a way of life in the South and Western states and we have had our share of them. These wind storms are graded on the Fujita scale (or the newer Enhanced Fujita Scale) on a scale of 1 -5. The worst of these storms destroy the homes and building in their path. In our capacity as contractors we have restored properties damaged by homes particularly for a time in Mebane, North Carolina. I restored a dozen or more home following a wind event in and around Greensboro with Nationwide Insurance company. Almost every agent in the county brought us projects and I was told that at what time I had more cranes running than anyone but the railroad and I was giving them a run. What I learned from this experience is that tornadoes can absolutely affect one building completely different than the next. We saw this again in the tornadoes that hit central Mississippi on Christmas of 2015. There we worked as umpire on a multi-million dollar claims involving a large home that was destroyed. Still with all the wall and roof damage there were rooms that were dry and the contents unaffected by the wind. The trick being from there is whether one can get them out of a damaged house and to dry storage without them being damaged further by rain. In Pensacola, we had major tornadoes last year and we have been active in getting these claims resolved in mediation s well as appraisal. We work both as hard construction contractors and in the alternative dispute resolution process included in most property insurance policies. 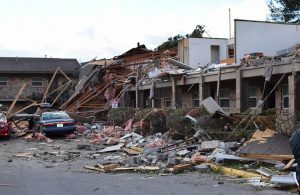 In these capacities, we have seen the time that it takes to restore a loss from tornado damage, the scope and costs of damages to the building and contents.